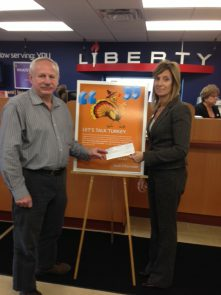 Doug Truit from Berlin Social Services accepts a check from Michele Tine of Liberty Bank and the Kensington- Berlin Sunrise Club. The local Rotary Club raised $775.24 and received$193.84 match from Liberty Bank for a grand total of $969.05. The funds will provide food for Thanksgiving meals.